Fire Diamonds Pokie Review - Play today! Fire diamonds are also known as the hearts on fire diamonds and they are the most popular of the branded diamonds. Known as the world’s most perfect diamonds, the critics agree that fire diamonds are some of the best cut out there. This is as good as excellence gets and if you are only satisfied with the reel deal, fire diamonds will appeal to you. This pokie offers players reel with 40 paylines loaded with exciting features like expanding symbols, stacked symbols and bonus features. The flames burns high and a green snake protects the diamonds as this pokie opens on your screen, what is most exciting is the brilliant cut of the huge diamond revealed. The background changes from deep red velvet to blue and you can constantly enjoy the high quality symbols offered on the reels. Flames lights up excitement on the reels and the symbols includes diamonds in different shades, white diamonds are protected by a green snake, the diamonds colour shows off as the purple dragon holds it, and it glows blue when the blue dragon enjoys its view, the red dragon shows its burning desire and the gold dragon keeps it locked and save. The ace to nice symbols completes the collections. 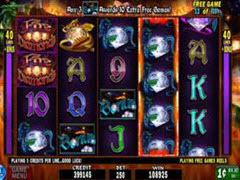 On the pokie reels you will see all the symbols can appear stacked, this featured is called super stacked, and its function is to advance players with a much higher win possibility as they can appear on all the reels and activate all the paylines at the same time, definitely a feature worth having. The fire diamond game logo appearing in front of flames will show the wilds in the pokie. These are hot enough to also appear stacked and change itself into any other game symbols to give you the advantage of additional winnings, the wilds cannot change into the scatters at any point during the game. The scatter show the word bonus in green and can appear on reels 2 to 4 only. The scatter reserve 2 different rewards, but will only share them when all 3 are shown at the same time. A nice thing about the scatters is the fact that they do not need to appear in any line to bring out the fun they hold within. With all 3 scatters showing you will firstly receive a multiplier for your effort that will be multiplied by the amount you have wagered when the feature started. The second reward will be bonus free games that will be revealed with the initiation of the feature, the game will forward you to the feature right away. Dramatic background sound keeps you excitingly waiting for the big win and you are greatly rewarded for each winning combination with these high paying symbols. The game is highly entertaining and nonstop action keeps this game an excitement from start to finish.